The Pompeii Sustainable Preservation Project, a consortium of 10 research institutions lead by Fraunhofer-Gesellschaft, devotes itself to the conservation of the necropolis of Porta Nocera in Pompeii. It helps preserve the ancient city, develops new materials and sustainable solutions for successful restoration work, and trains a new generation of professionals in conservation and cultural heritage. 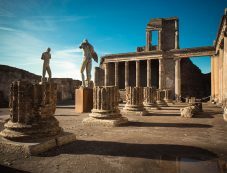 You can support its efforts through the Friends of the Pompeii Sustainable Preservation Project.